And a lesson from expert Abbey Road Engineers Alex Scannell and Stefano Civetta. 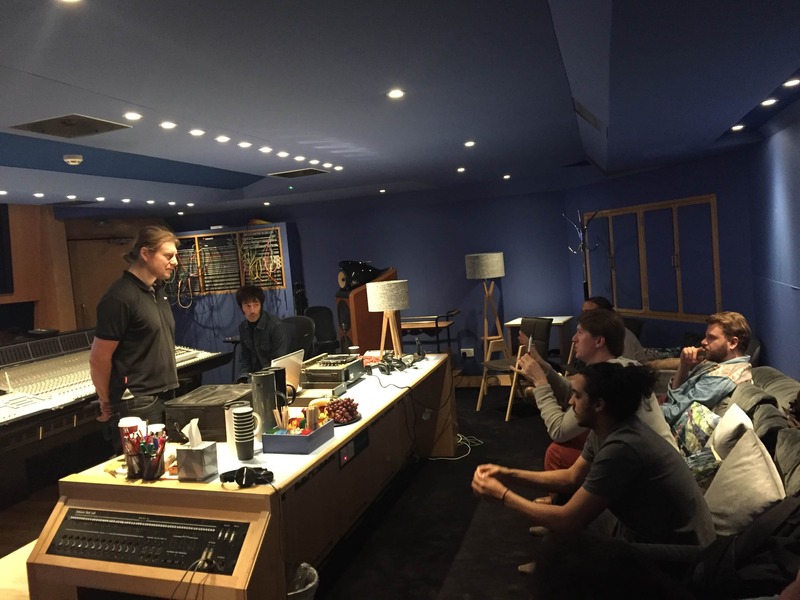 Last week our March students were part of a recording session in Studio Three with the band Desert Ships. 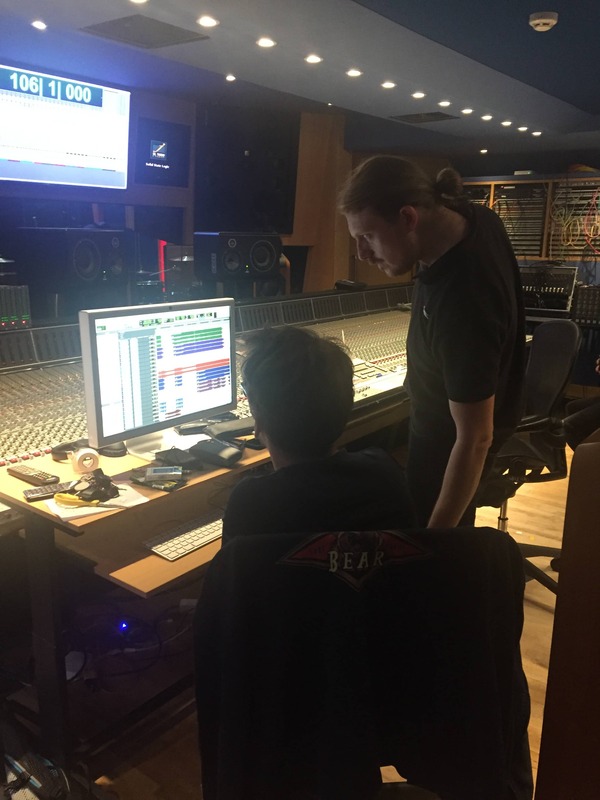 They worked alongside highly experienced engineers Alex Scannell and Abbey Road Studio assistant engineer and Pro Tools expert Stefano Civetta. We’ve been working closely with both Alex and Stefano over the past few months who themselves have worked with some big names such as the recent Mercury Music Prize nominee Ed Sheeran, Mary J Blige, One Direction, Andrea Bocelli and Ellie Goulding. Alex and Stefano gave us a masterclass in studio set up. They spent time taking the students through their pre-production notes and then the practical work started. They placed the Ampeg SVT Bass Combo in the far left isolation booth. Our students then worked with Alex, moving the guitar amplifiers around the live room to find the place in which they sounded best. They decided to place the guitars behind baffles to create isolation from the other instruments. The piano was recorded in the far right isolation booth and the bass and snare drum tested out in different locations to find the best sound. The ‘best sound’ is often about creating texture and personality within the recording and requires a creative and experimental approach. The rest of the kit was then built up around this position. 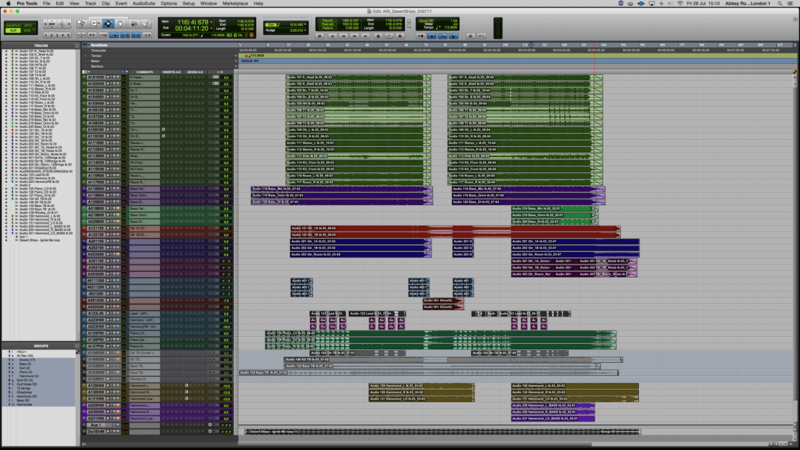 After they completed the initial setup stage and prepared the Pro Tools session, Desert Ships began tracking. The band recorded everything together in order to get the best live take for the drums, bass, electric guitars and piano. After multiple takes, Desert Ships, Alex and Stefano, chose the best take in order to begin overdubs. Different parts of the recording session were selected to overdub. These included sections of the recordings by the lead and backing vocals, acoustic guitar, Rhodes keys and the Hammond organ. The acoustic guitar was set up in the live room with a Neumann U47, which is a mic that we also use in our own Institute recording studio. Alex also tracked the lead and backing vocals with the Neumann U47. The Rhodes was recorded via DI box and the Hammond organ was recorded with Neumann U67’s. With the session complete our students now have a recording which they will each work on to edit and mix. The day was a really productive practical and creative learning experience for our students, working alongside such experienced engineers as Alex and Stefano. The next step is for our students to put these skills into practice with further sessions in our own studio.